On Sunday I went to a bridal shower for my friend Jane who is getting married in May. It was a perfect shower with lots of conversation about food and shopping and other delights. As we were all admiring the present of a baking pan, one girl began reciting what she said was a terrific recipe for brownies. There are few things I can concentrate on besides Leonard Pennario but baking is one of them, and I was interested. The woman got to the part where she said it needed a package of baking chocolate. "You used to use a package of it," she said. "Now the package is too small. They downsized it." Then everyone began complaining about things that had been downsized. I was in heaven! Usually this is a private gripe of mine. I am normally a solitary shopper so I can complain only to myself about 16 ounces becoming 15 ounces becoming 14 ounces. And the incredibly shrinking dish soap. (See the picture of Dawn-sizing, up above.) Even the stuff I use to clean my retainer is being downsized, I noticed last time I was at Dollar Tree. It is annoying and boring and it never ends. 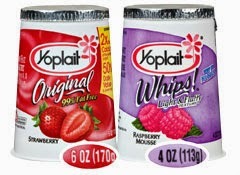 ... well, let's just say, Yo Mama, Yoplait! The list is the one thing that is not being downsized. It gets longer and longer, son of a sea cook and fie. 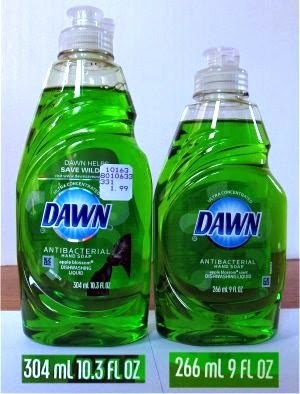 The downsizing can be more annoying than the price rising because it suggests that the manufacturer thinks you are stupid or that you will not notice. Anyway, at the shower we had a fine time griping about all of this. I cannot remember when I so enjoyed an afternoon. I love to kvetch! Even on Holy Thursday when I should be writing about pious things. Ok, you being a music critic I'm sure you've many times noticed how so many conductors (the majority, in fact) omit repeats in many symphonies from the Classic and Romantic periods. Would you call that downsizing, too? I would but it's fine with me because I like my music nice and concise. Violinhunter, I hate when people omit repeats! I am glad you mentioned that. Also people take some pieces too fast. That is a kind of downsizing too. Less time!